Grant Wharington is a driven man. That’s no surprise to those who have followed his career, yet it’s also what has made it possible for him to enter the 2006 VOR … twice. His focus right now is all about Brunel and the VOR, nothing else. Actually “driven” is an understatement when it comes to this man. He loves challenge and doing this race has been his goal for a long time. Each time he felt he was almost there, some new financial constraint seemed to appear, so he drove even harder and kept on fighting. "Give up" is not in Grant Wharington’s vocabulary, nor does it come across in his persona. 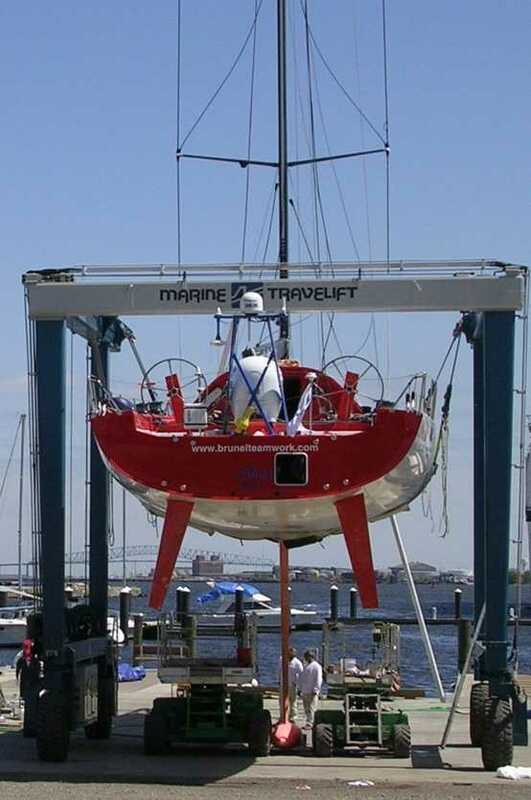 Ever since it was announced, in Melbourne, that Grant Wharington would not compete in the next two legs of the 2006 Volvo Ocean Race, but would rejoin in Baltimore, people have been asking “Why”? 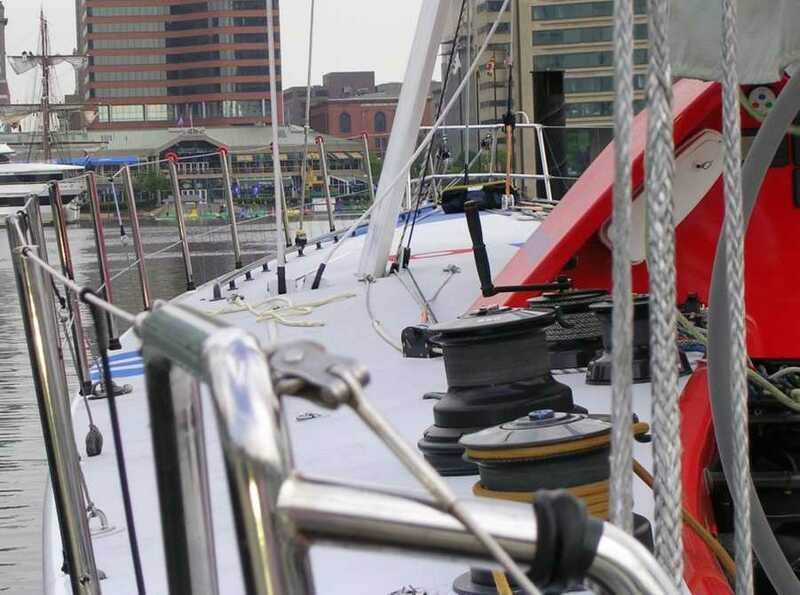 Now that Brunel is in Baltimore and ready to race, people are also asking “Will the changes to Wharington’s Brunel have made it significantly faster.” I went along to find out and caught with Wharo in Covington Harbour, Baltimore, during the stopover between Leg 5 and Leg 6. The boat was originally designed by Don Jones, of Skandia fame. I asked what was taken from Skandia for use in the design of the VO70 and, according to Wharington, they’re very different boats. 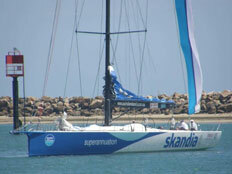 Simply put, Skandia is 9m longer and was built without the rule restrictions that apply to the VOR boats. 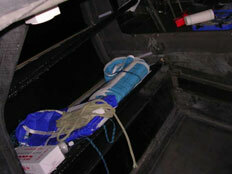 What was carried over were the keel geometry and hydraulics related to the rams and controls. Bearing in mind the problems with other keels, it has to be acknowledged that the Brunel boat had none of those issues in the initial 2 legs of the race. They are counting on this reliability to continue and have no reason to believe it won’t. Brunel also started with a fixed canard with twin tabs. The idea was to make it small enough that its being fixed would not be an issue, but it ended up being too small to be effective, so the decision was made to replace it with twin daggerboards, in order to have competitive similarity with the other boats in the race. The same sort of decision was made with regard to the sails; Doyle sails were replaced with North sails, after the narrowing of the shroud base. I asked if there was a specific issue with Doyle, but Wharington he denied having any manufacturing difficulties with them. It was just that, in order to be more competitive, it was decided that they would follow One-Design theory; much like the Etchels fleets, where you know you’re up against exactly the same boat. So, if you’re not doing well, it’s “mirror time”, because you can no longer blame differences in the boats. All these changes, yet the rules say “Repair, modification, or addition may be made only while not racing, with the approval of the race committee. Such repair, modification or addition shall not significantly change specifications, performance or measurements.” Changes to the bulb, shroud base, sails, reprofiling of the rudders and replacement of the canard with twin daggerboards certainly constitutes significant change. So, how did Brunel stay within the rules, as stated above? 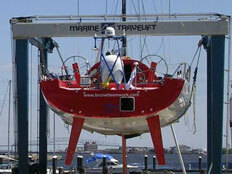 Quite simply, the boat was withdrawn from the race after Leg 2. The modifications were made, the entry fee was paid all over again, she was remeasured, and a fresh “new” Brunel entered the VOR in Baltimore at the In-Port race. Gone are the points earned in Legs 1 and 2. They’re literally starting from zero half way through the race. Now, though, Wharington has the boat he wanted. 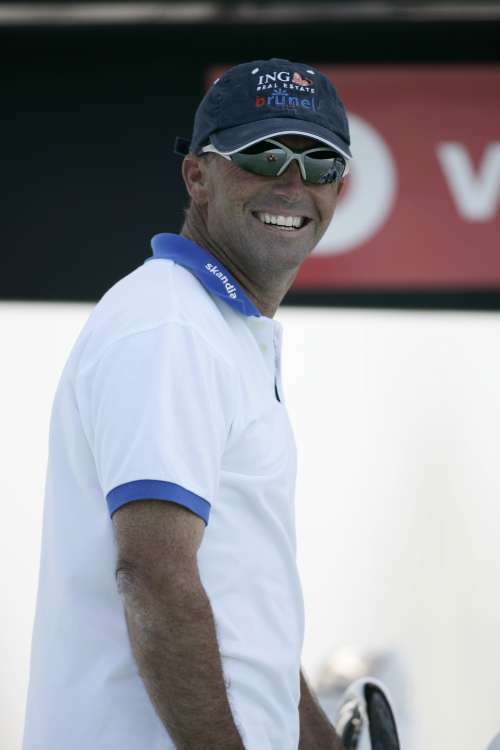 Losing his major sponsor, three months before the start, meant leaving Spain with a good boat, but a boat that was not as good as it could have been. With Brunel’s support, after some candid discussion, it was determined that the investment in such drastic changes to the boat would provide a competitive boat and an acceptable return on investment to Brunel, in a hemisphere where they have market interests. Give a place in one of the bunks to a Dutchman, for on shore interviews, in Rotterdam, and the mix is good, where the sponsor is concerned. Ed van Lierde is not, however, the only new addition. Three others - Mitchell White, Phil Airy and Phil Harmer - have joined Brunel since leg 2 and that means almost half the crew is new to the boat. According to Wharington, they are not, however, new to each other, having been flown in to Australia to compete in races on Skandia. So, the the process of building teamwork and camaraderie, which the other boats have been developing on Legs 3 and 4, has occurred with the Brunel boys. It is, however, another inescapable fact that the other boats have had 2 full legs of activity, where they have not only learned about each other, but about their boats; how to make them go faster and how to work most effectively together. The learning curve for Brunel’s crew will be steep, but Wharington is confident that they will learn quickly. 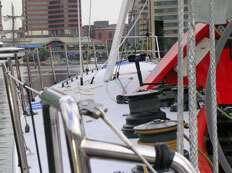 He does, however, acknowledge that the boat is very different since the modifications and fine tuning will take time. The Farr designed boats are noticeably faster in light airs, while the Juan K ABN-AMRO boats seem to relish heavy weather. I asked Wharington where Brunel’s “sweet spot” lay. So now that the man and his boat have arrived, for the second time, at the start of the race, what is his goal? Is a speed record in the cards? A confident “Possibly” was the reply. The old Brunel managed 503 nm in 18 hours (an average of 27.9 nm/h) prior to the withdrawal and modifications. Now, with the drag of the canard gone, the boat is, definitely, capable of going faster, but a lot will depend on weather conditions. 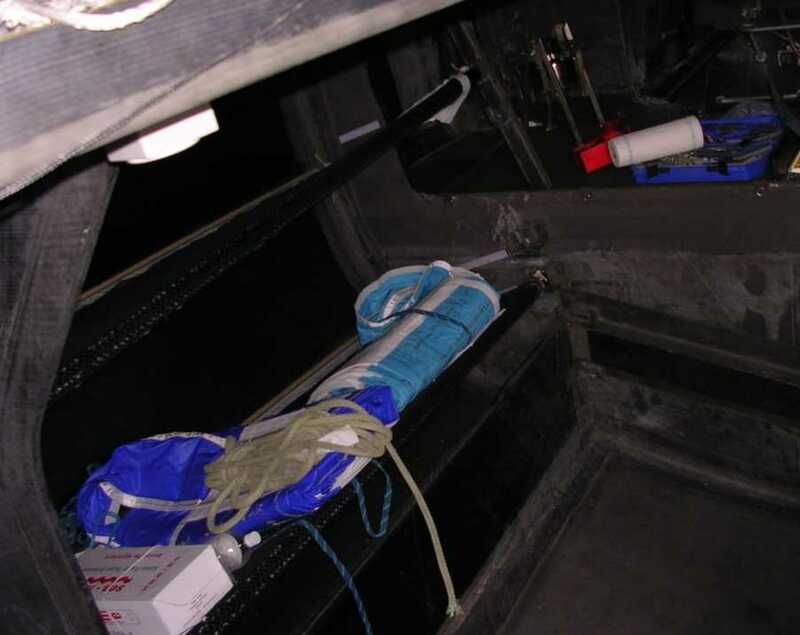 “Would you be prepared to sacrifice rhumb line, for the possibility of breaking the 24 hour speed record?” I asked. Wharington said that, although he had no intention of sacrificing a podium position just to gain the record, arriving in Europe with a speed record would certainly be positive publicity for Brunel. That is a decision that will be made on the race course at the time, not on the docks of Baltimore. All the crew members were busy about the boat, when I went over her, but I managed to stop Ed van Lierde for a quick moment and asked him how he felt about this incredible opportunity. 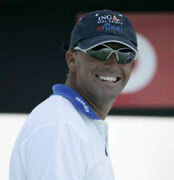 He made no attempt to hide his delight at being chosen and was still awed over the 30 knot start, in Sydney, on Skandia. The 5 kts, thereafter, were a bit tough, but to start at 30 kts was obviously a real kick for him. After almost 2 months with the team, he’s quite comfortable and looking forward to the start of his first Volvo Ocean Race leg. I must thank Bindy, Grant, Matt and Ed for their time and courtesy, at a time when they were all very busy. Their attitude and that of everyone else on the team exudes quiet confidence, they think they have got it right this time and they are eager to prove it.